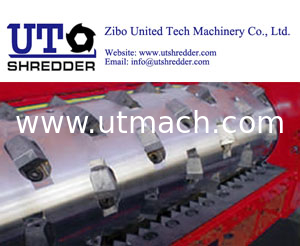 Introduction: Single Shaft Shredder in Zibo United Tech Machinery Co., Ltd.
With the function of Siemens microcomputer control system, shredder in Zibo United Tech Machinery Co., Ltd is possible to control automatically start, stop. Automatic reverse sensors to protect the machine against over loading and jamming. The output capability typically range between 300kg/hr -5,000kg/hr+ depending on the different model and different materials. * Equipment passed the CE, meet the Europe Safety Standard.